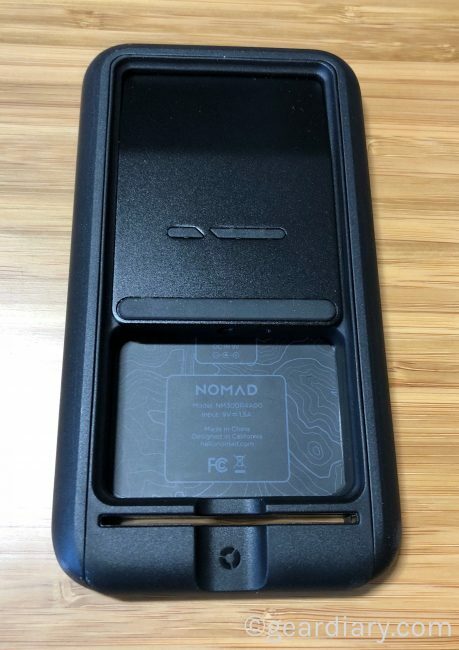 At $59.95, Nomad Wireless Travel Stand is a bit on the pricey side. 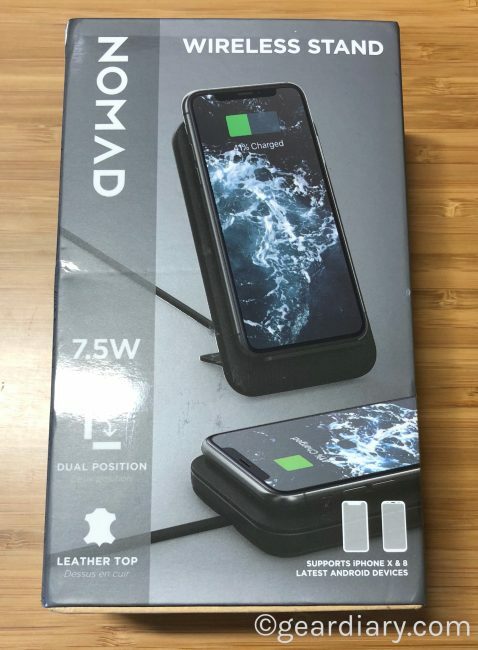 Made from leather, metal, and plastic, it is not only designed to look good but, with 7.5 W of power, it does a great job charging a phone quickly and easily. That, however, is just the beginning. 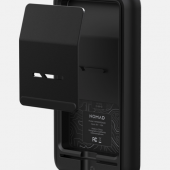 As is always the case with products from Nomad, the charging stand from premium materials. There’s a Horween leather top surface layer over a sturdy polycarbonate frame. 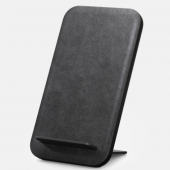 The fact that leather is used the charging surface stands out for a few reasons. First, it looks good. It has a refined look that is missing from all of the other wireless charging stands that I purchased. Those are made from plastic and look rather utilitarian. 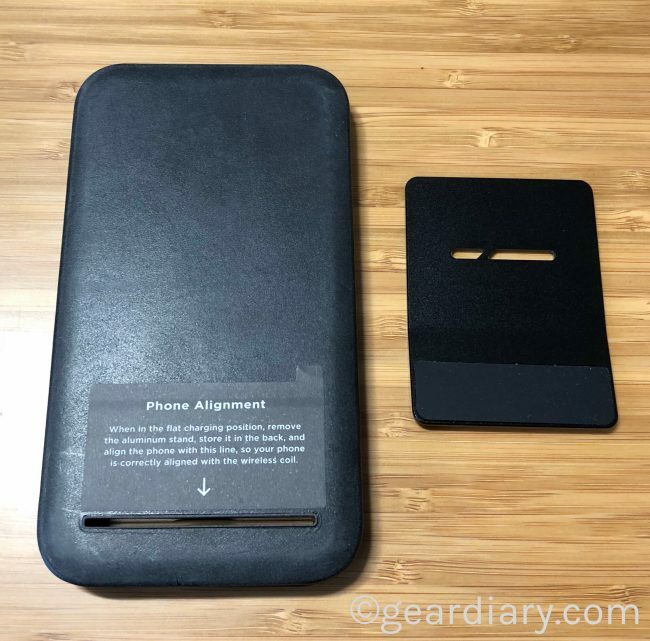 In addition, the leather surface is soft so when you placed your iPhone on it you don’t have to worry about the hard surface of the stand coming in contact with the glass back of the iPhone. Another reason that this charging stand stands out is the fact that it works in either in vertical or horizontal positions. All of the other wireless charging stands I have either hold the phone vertically or flat. I tend to use charging stands that hold the phone vertically at my desks so I can see what is on it. I use one that lays flat next to my bed so the light doesn’t bother me if a message comes in overnight. This charging stand can do both. 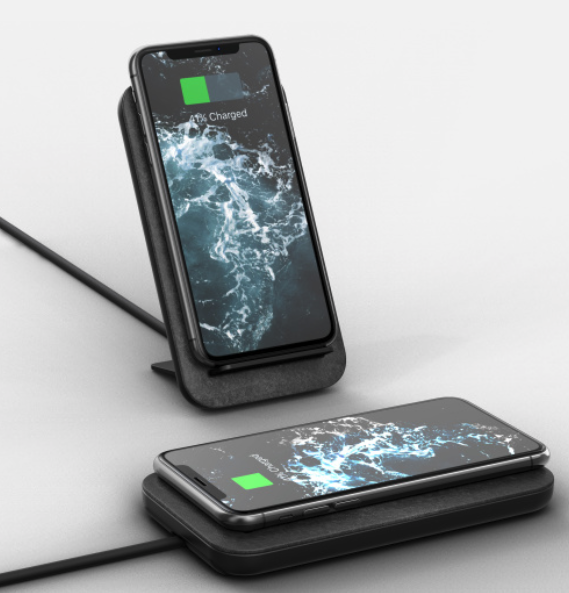 It looks like a charging stand designed to hold the phone flat, and it is. But hidden in the back of the charging stand is an aluminum kickstand. 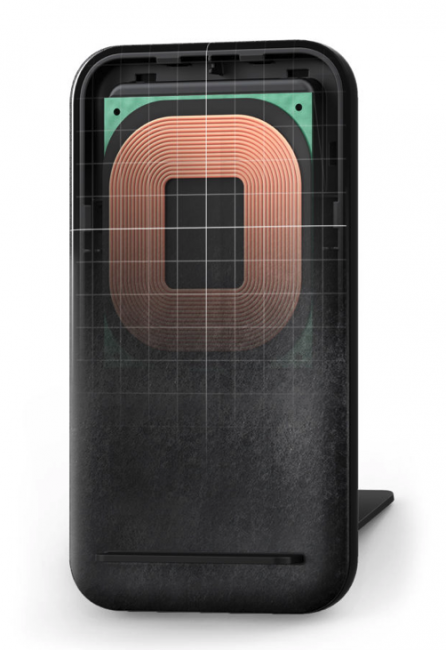 Upright Position: Designed to be used deskside or bedside so you can easily see your important notifications and alarms without having to pickup your phone. When you need to quickly respond to a message or turn off your alarm, not having to deal with cables makes everything so much simpler. 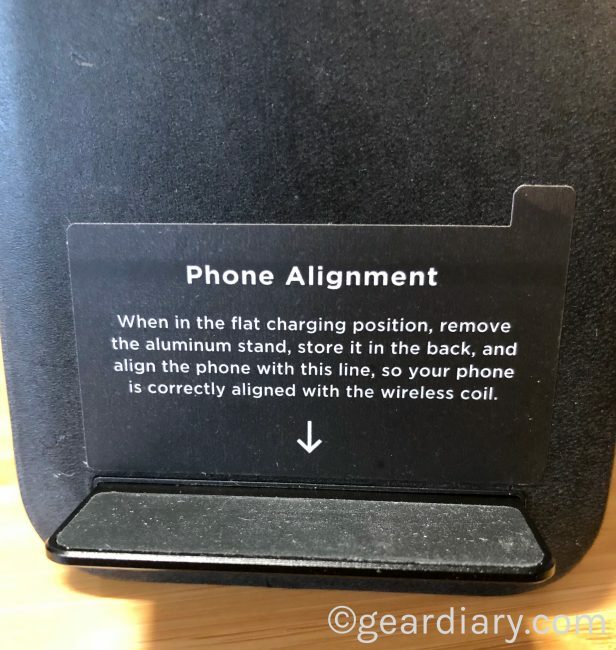 When you want your phone to be held upright —so you can see it easily — you pull the aluminum piece from the back and slide it through a slot at the bottom the charging surface. 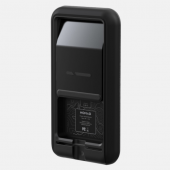 That turns the flat charger into a vertical charging stand. 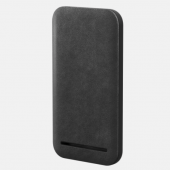 The metal kickstand even has soft material that protects the phone from coming into contact with the hard surface. 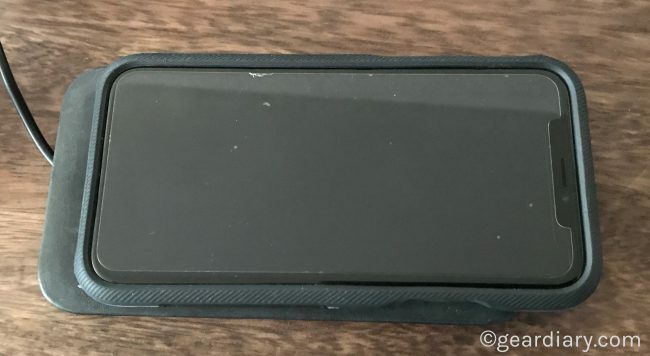 Also, when you’re using the stand in horizontal mode, the slot into which the kickstand slides is still visible and helps you align the phone properly, so it makes the proper connection with the charging surface. High Output: We know your time is valuable which is why we built a high-power 7.5W coil to give you a fast wireless charging experience. 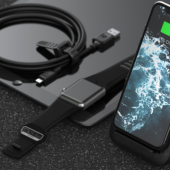 Designed to charge your iPhone X/8 as fast as possible. The Nomad Wireless Travel Stand ships with a wall adapter that plugs into the back of the charging stand. I like this more than some of the other stands I purchased that come with a USB plug but no adapter since it means that this product is complete in and of itself. That stands out because it is not just a stand for home or office use but is also something that you can bring with you when you travel. 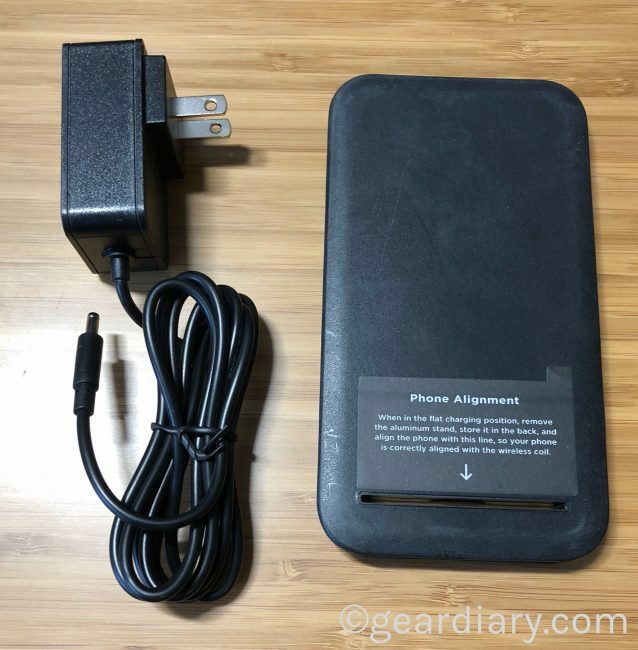 You simply pull the kickstand out, snap it into the back of the charging surface and throw the charging stand and the wall adapter into your bag. When you get to your destination you can pull them out and set up your charging system in seconds. The Wireless Travel Stand is wrapped with premium Horween leather for a rugged but refined look. The rubber base makes it extra stable so your charger will stay put. The charger stands upright and packs flat for easy travel—simply stow the durable aluminum kickstand. Optimized for iPhone X and 8 with a 7.5W charge output. 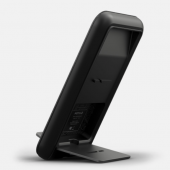 The pad offers a stylish and functional desk or bedside home for your iPhone X/8. Cable for the wall adapter is a meter and a half long so you don’t need to have a plug right next to your bed or desk. 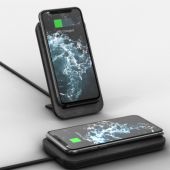 Travel stand is designed to be used for wireless charging, but only turns on the wireless charging if it successfully communicates with the wireless enabled phone. 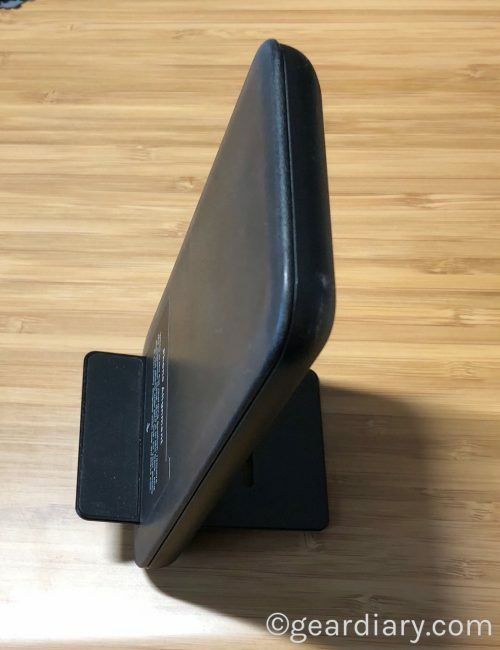 If no phone is on top of the surface there is no wireless power transmitted, so the travel stand can be used as a flat surface for resting other small items top. 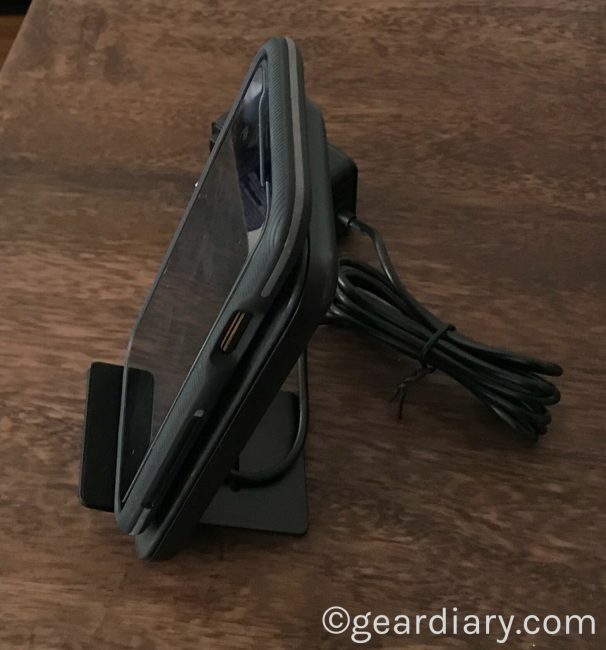 At $59.95, the Nomad Wireless Travel Stand stand is a bit more expensive than some of the options available on Amazon but does charging stands don’t have the flexibility of working either in vertical or horizontal mode, don’t have a beautiful leather surface, may not charge as quickly as this one does, and they don’t have the smart feature built into it that only draws power when the phone is sitting on top and connected to it. I love this wireless charging stand and have decided that it belongs on my desk at home. That way you get to use on a daily basis but since right there when I’m packing for a trip I love it and I have no doubt you will as well. Check it out here.